This is a recipe given to me by a co-worker. 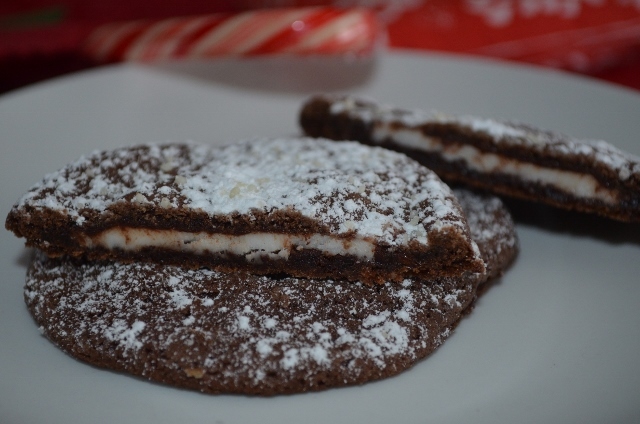 A great chocolate cookie with a mint candy surprise in the middle… You can either use the whole peppermint patty in the cookie or use just half of the patty. 2. In a medium bowl, whisk together flour, baking soda, salt and cocoa. Set aside. 3. With a mixer, cream butter and sugars together until smooth. Add in eggs, one at a time. Next add in vanilla and mix until combined. 4. Gradually add flour mixture and beat until flour disappears. Lightly flour your hands, then take a golf ball sized ball of dough, roll into a ball and flatten into a disc. Place a peppermint patty in the center and wrap the excess dough up and around the patty. Make sure the entire patty is covered. Repeat with remaining dough and place on prepared baking sheet, about 2 inches apart. They look great! I too have written a piece on Christmas. Let me know your opinions in the comments!